Outlander returns from a very long break to reveal the fate of Jamie after the Battle of Culloden and show Claire attempting to settle into life with Frank in 1948. The mythology of this show continues to grow and develop in ways that I find surprising. It’s a very difficult show to predict and that’s definitely part of the appeal. At first it seemed like it would be a story about a woman out of time and struggling to deal with living in her new surroundings while she tries to return to her native time period. For a while that’s definitely what it was and it consistently did an effective job of exploring that story. 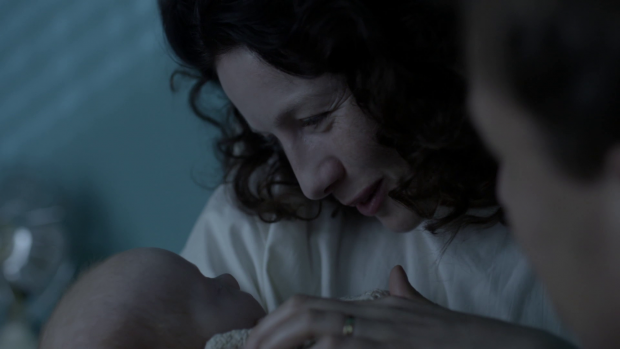 This began to shift in season 2 with the first episode showing Claire’s return to her present and the last episode showing what her life had become intervening 20 years. The evolution of the show may be gradual but it’s definitive and confident. It’s almost as if the production team started with small yet significant changes to prepare the viewer for a very different third season. I haven’t read the books so I’m unaware how the story progresses there but from the point of view of the TV show that’s how I see it. “The Battle Joined” opens with the aftermath of the Battle of Culloden. Bodies are piled all around and it is heavily implied that the battle was incredibly brutal with a large human cost. In the midst of this is Jamie who has survived against all the odds but barely. His breathing is laboured and he seems to be in a state of shock due to what he has been a part of. Flashbacks depict small excerpts from the battle to give a flavour of what was experienced but much of the detail is left out. 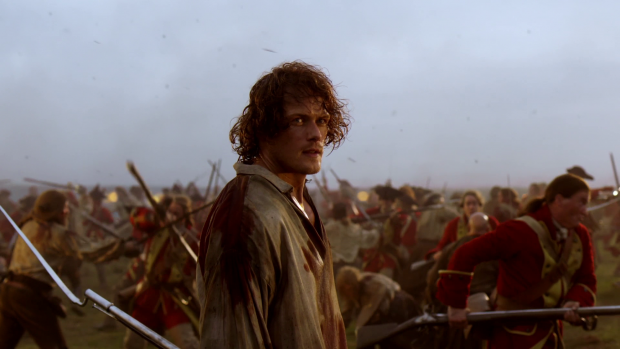 I suspect this was a budgetary decision and if it was the show hides it well by connecting the battle sequences to Jamie’s emotional state. We see his reaction to his friends and family dying around him as he struggles to keep himself alive. It’s chaotic and devastating without being too visually brutal so the episode manages to depict the violence without being too graphic. 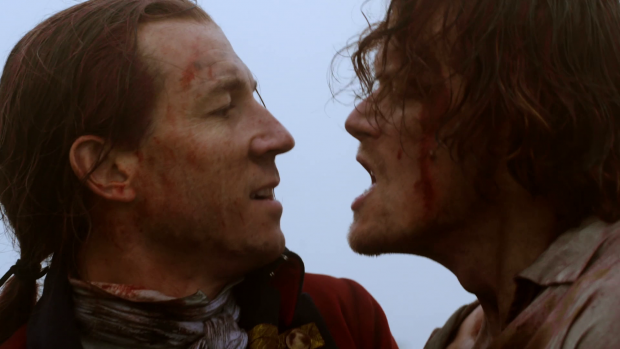 There’s an element of catharsis thrown in there when Jamie finds Jonathan “Black Jack” Randall among the combatants. Having the opportunity to kill Randall is something Jamie has wanted for a long time. The man has done things that almost broke Jamie’s spirit, been a constant source of danger to both himself and Claire and is generally just an awful person so Jamie’s desire for revenge is completely understandable. Their fight is silent and visceral with both actors really selling the intense hatred that has developed between them. Sam Heughan in particular sells so much with his facial expressions from the determination to be the one to deliver the killing blow to the satisfaction when he finally lands it. Cutting back and forth to Jamie lying in shock remembering the altercation before revealing that the dead Red Coat lying on top of him is Randall works really well and the role reversal from the season 1 finale “To Ransom a Man’s Soul” with Jamie being the victorious one as they lie next to each other was a nice touch. Once the survivors were rounded up we see a sense of honour on both sides when Rupert accepts the label of traitor bestowed onto him and his men by Lord Melton (Sam Hoare) who grants them a soldier’s death which basically means being shot standing up instead of hanged. Those who can’t stand under their own power will be propped up. It’s dignified and a sign of respect from Lord Melton who sees his opponents as men who deserve certain considerations. Rupert accepting the label of traitor for himself and his men says a lot about him as it shows he is committed to the cause he fought for even in defeat. The Scottish forces feel that the death is a righteous one and they see no shame in it. Lord Melton sees worthy opponents and can at least show them some respect in their final moments. Lord Melton’s honourable nature becomes important for Jamie’s survival. Once he hears the name he recounts the time Jamie spared his brother’s life earning him a debt of honour within the family in the process. Lord Melton can’t hand him over as a prisoner or shoot him without disgracing the debt that hands over his family. The only thing he can do is arrange transport for Jamie to Lallybroch. It’s possible he might die on the way but the distinction there is that would be circumstances killing him rather than an order by Lord Melton. This absolves his family of the debt and allows honour to be upheld. This felt a little too convenient as a way for Jamie to be spared. The idea that his actions have consequences and his overall decency means that his kindness is rewarded is a solid idea but this was an impossible situation with no hope of escape so this felt a little too convenient. It happens so quickly that there’s a rushed quality to it. Another issue with these scenes is that the executions come across as being very mechanical. They definitely will be seen that way by the English soldiers but Rupert is executed off-screen with very little fanfare. He meets his breath bravely by volunteering but he deserved better than an onscreen death. In 1948, Claire is having trouble adjusting to being back. She accepted Frank’s terms last season so has committed to living with him and letting Jamie go. This is easier said than done as she has the constant reminder of Jamie growing inside of her. Her relationship with Frank is a tense one as she has accepted living with a man she doesn’t love just to provide for her child and establish a sense of security for herself in the present day. The lack of chemistry between Tobias Menzies and Caitriona Balfe works in their favour when it comes to their scenes together. They are supposed to be awkward together because Claire would rather be living in the past with Jamie but finds herself stuck in the life she has agreed to. The really interesting thing about this is that Frank isn’t a bad person. he’s doing his best to accommodate Claire’s wishes and come to terms with the fact that she fell in love with another man and carries his child. He has basically accepted that Claire cheated on him and broke their marital vows before returning to him with no intention of apologising. When you remove the time travel from the scenario this is a very relatable problem that people face and it shows Frank’s strength of character when he is willing to accept what Clare has done to him for the good of a child that isn’t even his. The argument they have over intimacy is a believable one as well as it’s not out of line for Frank to expect that from her now and again considering she has agreed to uphold their marriage. Her reaction to him trying to touch her pregnant stomach shows just how far Claire has to come before she can feel comfortable with the life she has chosen. This is further reinforced by her rejection of the modern world. 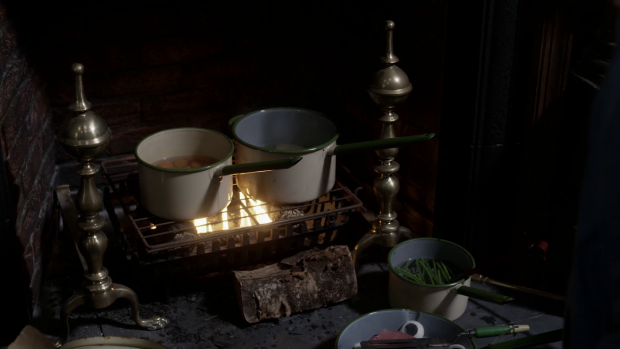 She can’t get the cooker to work so returns to the rustic method of cooking that was normal back in the 1800s. She seems at peace when working like this because it reminds her of the life she left behind and there’s a sense of comfort to reclaiming a small piece of that. Strangely Claire does embrace all that is new about the United States while rejecting modernity though there’s likely something deeper there that will pass somewhat as she becomes more comfortable in her life. We see that she has somewhat come to terms with her situation in the season 2 finale so we know that she will eventually settle in to some degree. Another interesting aspect of her life in 1948 is the exploration of gender roles. Claire is intelligent, independent and very strong willed so being treated like a woman would in post World War II America is very jarring for her. Her neighbours advice about making sure the husband is fed and looking pretty for the boss pays off when she is mocked for expressing an opinion later in the episode. It’s a good scene and Caitriona Balfe plays the disgust on Claire’s face wonderfully. This also comes into play when she is in labour and the Doctor talks to Frank rather than her before making decisions about her body without involving her. It’s really jarring and an interesting piece of background setup that should hopefully continue to bubble throughout the season. The birth of Brianna is seen as a turning point for Frank and Claire but the mention of her red hair shows that they are both kidding themselves. Jamie can’t simply be forgotten and they both know it. The fact that Brianna will grow to resemble Jamie so heavily and be sporting red hair as a constant reminder will make things difficult. I look forward to seeing how Frank continues to deal with this throughout the season. It’s good to see the character return as Tobias Menzies is very good in this role and the character is wonderfully complex. On the surface it seems that there is little to connect the two time periods. The main plots don’t match up and the characters aren’t interacting but the connective tissue comes from the sense of emptiness experienced by both Claire and Jamie. They are each learning to live without the other and there’s a lot of pain there to work through. We learn that they don’t see each other again for at least another 20 years. I have to assume that the relative passage of time is the same; i.e. 20 years for Claire is also 20 years for Jamie. I wonder if we will see Claire and Jamie interact at all this season save for perhaps the finale. It’s a very risky thing to have the core of the show separated for so long so it’ll be interesting to see how that plays out. An excellent opening to the season that depicts the aftermath of the Battle of Culloden wonderfully. Showing Jamie lying on his back in shock reliving the battle in his mind works really well and the catharsis attached to him finally defeating Jonathan Randall is a welcome addition. Showing the honourable side to Lord Melton as he insists they meet their end with dignity is interesting though the convenient plotting that allows Jamie to survive feels somewhat tacked on. 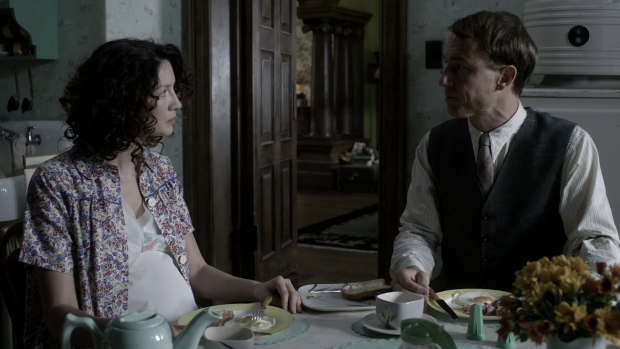 Claire’s life in 1948 is also well handled with a really tense and awkward relationship between her and Frank. Claire’s difficulty settling into modern life is really well handled from her difficulty using modern technology to being dismissed because she’s a woman. The tension between her and Frank will be continually reinforced by Brianna’s red hair representing a constant reminder of Jamie. It’ll be interesting to see if the show will keep Claire and Jamie apart all season or if they will reunite sooner rather than later. I’ glad to see that you continue to review Outlander. Since we as guys are the minority in the Outlander following, it is good to find another guy talk about the show. At the recent San Diego Comic Con, Starz setup a replica of the “Print Shop” where Claire and Jamie have their reunion. You will not have to wait all season for this reunion. If you watch the trailer for S3, at the very end it shows Claire entering the print shop. FYI: You miscredited the role of Lord Melton with David Berry. Lord Melton (Hal) was actually played by Sam Hoare. David Berry will play Lord John – Hal’s brother who incurred the debt of honor – in later episodes. Good to see you in the comments section again. Thanks for the comment. I didn’t see the trailer for season 3, didn’t see the need but that’s good that we won’t be kept waiting all season. What did you think of the episode? My bad on the actor thing, I realised I got it wrong shortly after publishing but neglected to fix it. Sorted it now though. I enjoyed the episode very much. Ron Moore did a great job writing it. By my own estimate, only about 1/3 of the episode came from book 3. There were some little tidbits in this episode that readers learn in later books. The battle scenes came mostly from the TV writers, with consultation from Diana, of course. I agree that Lord Melton honoring a family debt was convenient. Except for some brilliant one-liners from Jamie, the scene in the farmhouse was mostly book. There will be a few more “coincidences” this season too. Despite them, Voyager is my favorite of the eight published main books. It was a good opening to the season. I haven’t read the books as you know so I just take all the narrative as it comes. Sounds like Ron Moore and the other writers do a really good job of adapting this by considering the narrative as a whole. Spooky. It reminds me of the alleged Titanic survivor named R. Dawson despite the fact that Rose was a fictional character in the James Cameron movie.